SambaLá will be parading in Pompano Beach at the Brazilian Fest in 2016 in grand Rio de Janeiro style with more than 100 people at 2:30 pm. The event and parking is free. Madrinha sa SambaLa, Valeria from Los Angeles California will be participating for our Parade! School in Pompano Beach as well as at the Milagro Center in Delray Beach at their teen center. Two special dancers from Los Angeles will be coming in parade and dancing exclusively for the event will be “Madrinha da Bateria” (godmother of the drums) Valeria as well as the Musa from California, Marisa Montoya. And direct from Brazil, sponsored by SambaLá Samba School is the former King of Rio de Janeiro (for 10 years), Alex de Oliveira who will be the master of ceremonies and who is the Carnaval Director and Carnavelso of SambaLá Samba School. Alex has been the carnavalesco or carnaval artist for samba schools in Rio including Portela, Jacarepagua, and Rocinha. 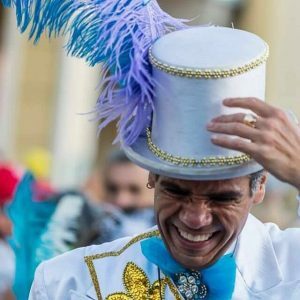 Alex de Oliveira, former King of Carnaval in Rio de Janeiro will be master of ceremonies for the parade and SambaLa stage show in Pompano. The parade will start right at 2:30 pm at the Pompano Community Park near the Pompano Airport in Pompano Beach Florida.